John Elgin Woolf specialized in the creation of elaborate residences in and around Beverly Hills for wealthy Los Angeles clients in the entertainment industry and socialites. Woolf believed in the potential of design to improve everyday life and his architecture emphasizes the elements that were important to his clients - the entrance, facade, classical symmetry and privacy. Woolf incorporated exaggerated Classical forms with modern spaces and created a new architectural vernacular in Hollywood for glamorous movie-star living. He amalgamated 19th-century French, Greek Revival and Modernist elements into a mixture that was christened Hollywood Regency, which foreshadowed aspects of postmodernism. This Hollywood Regency style brought Classical opulence back into vogue, offering an alternative to the rigid Streamline Moderne style that Hollywood had wholeheartedly embraced for the previous decade and a half. With its high ceilings, perfect proportions, grand public rooms, multiple fireplaces and dressing rooms, the John Woolf house was a residential palace for Hollywood royalty. 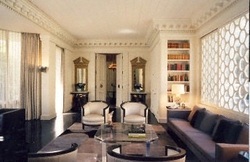 During the height of her television career, Loretta Young commissioned Woolf to design a house for her and her family. The compound was built in 1953. Designed in Hollywood Regency style, it has a six-bedroom main house, staff quarters, a pool, a pool house, a 10-garage motor court and a number of chic townhouse-style units. The entrance to the main residence is through Woolf’s legendary oversized black Pullman doorway. Entering the foyer of white marble flooring, another pair of Woolf’s oversized doors with large brass knobs ushers one into the living room. These doors are not just any doors. They were the most famous doors in TV history, the doors Loretta Young swung open and swirled through weekly on her 1950s TV show. Well, not the actual doors, but the doors the famous doors were copied from. The living room's 12-foot-tall curved glass walls literally wrap around the swimming pool. At the center of them, Woolf set his signature marble fireplace. The public rooms are reassuringly grand with formal interiors, architecturally significant crown moldings, imposing scale and stately finishes. There are private outdoor areas including a Japanese specimen landscaped center courtyard with terrazzo floors and a large yard with camellia and azalea gardens, brick terraced patios and an oversized pool, complete with Woolf’s signature pool house. The master suite is large, but its luxury lies in its bathroom and closets. The Loretta Young compound’s is important for its preservation of Woolf’s Hollywood Regency Glamour architecture, referencing axial symmetry, opulence and a return to visual splendor with classical period detailing and proportions. The architecture of the house has more in common with Versailles than with Hollywood. The extensive use of hand craftsmanship and expensive materials are meant to reinforce traditional notions of beauty, sophistication and comfort in living. The residence is very private with period French Deco wrought iron gates in the front. Guests living on the compound are said to have included Joan Crawford, Rod Steiger and Rock Hudson. Born in Atlanta in 1908, John Elgin Woolf, known as Jack, was raised in the Deep South, where he became enamored of the Greek Revival mansions that surrounded him. In 1929, Woolf, the son of two college professors, received his bachelor's degree in architecture from the Georgia Institute of Technology. With little work available during the Depression, he headed to Hollywood in search of a role in ''Gone With the Wind.'' Though he never landed the part, the elegant and witty Woolf began his mutual love affair with Hollywood and the social circuit. His client roster was a who’s who of Hollywood royalty. Woolf passed away in Beverly Hills in 1980.